WrestleMania in the modern age has a little dilemma. What should it be more of: a pro wrestling show, or an all-out entertainment spectacle? Back in the old days it managed to wear both hats well. Wrestling and spectacle managed to coexist peacefully. The WrestleMania Experience™usually consisted of some good, satisfying action that advanced everything logically. As the event turned into a fan convention that cared more about delivering what the company thought were highs (while still pushing people they thought would matter to most casual fans) the Experience started to become more about reactions from everywhere than the story. Why else have a seven-hour wrestling extravaganza, if not to say that you did? Nothing encapsulates this era of WrestleMania more than WrestleMania 34. Last year's Mania was all about beginning the next generation of WWE stars to pass the torch to. And with that new generation mostly entrenched now (we'll get to that in a bit) the company could now focus more on making the event OMG-worthy instead of being an indispensable cog in the onscreen narrative. There's nothing absolutely wrong with that, but when it's time to get back to regular programming, the effects are going to be huge. WrestleMania 34, in most respects, wasn't terrible. There were enough highs to sustain a wrestling crowd. A good number of storyline decisions were made with best interests in mind, but that's only one-half of the game. People like Nia Jax, Ronda Rousey, the Bludgeon Brothers, and Shinsuke Nakamura benefitted from the decisions they were involved in. But there were also those who didn't get the benefit of the cathartic WrestleMania moment—sometimes, all for a short-term high that doesn't go far past that night in New Orleans. It's evident in decisions like Brock Lesnar retaining against Roman Reigns or Charlotte ending Asuka's streak. When you've primed your up-and-comers, your future stars to take over, you'll need to deliver. You can't prop them up and then turn them down, in the name of sacrificing them for a shocking ending or to build someone else's already-stacked legacy. And it's even more confusing when you realize that they've managed to pull the trigger with other people who need it. WrestleMania is a celebration of a long year—what amounts to one full season—in the WWE's calendar, and it's no better place to blow off some steam. Fans, for the most part, aren't willing to prolong the agony because they believe it's time to start fresh, as the RAW after Mania embodies. If anyone's disappointed, it's because they believed it was time to start a next chapter, not to keep going with the next one. WrestleMania wasn't bad, but they missed out on a possible all-time great. New Orleans II has to go home with a B+. Much of WrestleMania 34 was built around the buzz Ronda Rousey brought, and they delivered. How could they not deliver, though, with the two men in the match and the amount of time they got? A great story unfolded right before our eyes, helped along by the fear that Triple H and Stephanie McMahon might have actually signed the new Rowdy One just to destroy her in their biggest show. If AJ Styles vs. Shinsuke Nakamura was underwhelming, it was only because they didn't get as much time as this tag match. Matt Hardy for the Andre the Giant Memorial Battle Royal is honestly the most sensible pick they could've gone with. That said, I don't agree with Naomi winning the Women's Battle Royal when it was so clear that Bayley needed that win. Cedric Alexander vs. Mustafa Ali was exactly what I expected it to be, and they can't do what they do on 205 Live on a stage like WrestleMania. I'm all right with Seth Rollins winning, so long as Miz didn't retain. It was time for them to set up new feuds with the Intercontinental Championship. Asuka didn't deserve to lose at WrestleMania. I'm also okay with Jinder Mahal winning the US Championship, because other than my clear Maharaja bias, the way it went down is obviously leading to a Mahal/Rusev feud for the title. This is where the title needs to go while Roode figures out what to do with his life (and possibly moves to RAW in the Superstar Shakeup). Undertaker looks even better than his past few appearances, making the most of his five minutes with John Cena. If this leads to a wider arc that sees Cena exploring the latter half of his career, then this quick match will have done its job. People were there to see the Undertaker do his thing, anyway, and his thing he did do. That said, I wish we got two more hours of Fan Cena—it may have been the best WrestleMania-thing Cena's done in a long time. I'm still of the firm belief that Daniel Bryan and Shane McMahon did not need to win against Sami Zayn and Kevin Owens. Yes, it extends their feud against the SmackDown Live authority, but floating around trying to get a job on RAW may just see them, well, flounder. It's entirely possible that both of them get sent back to SmackDown in the Shakeup, but I wanted to give this angle a fresh lease on life now that Bryan is an active competitor again. Many people are complaining about AJ Styles and Shinsuke Nakamura not meeting expectations, but we have to remember that this just isn't Wrestle Kingdom and they're never going to get Wrestle Kingdom minutes. That said, the match did its job for me—while Nakamura's clean loss did deflate us, they managed to bring us all back with the heel turn. The loss needed to happen because it's only the first chapter of their WWE story, and resurrecting the true King of Strong Style is how you harness the full potential of your Shinsuke Nakamura. This isn't over yet, and it's going to be a lot of fun. Braun Strowman choosing a child from the audience to be his partner is another embodiment of this WrestleMania being too short-sighted. Yes, it was a fun moment for the live crowd, I'm sure, but it damages your previous tag champions and your whole division so much. I get that the intent was to put Braun over as a monster of a man, but not like this. There were more creative ways to do this, and it could've at least been used for a surprise return the same way the Hardys did last year. 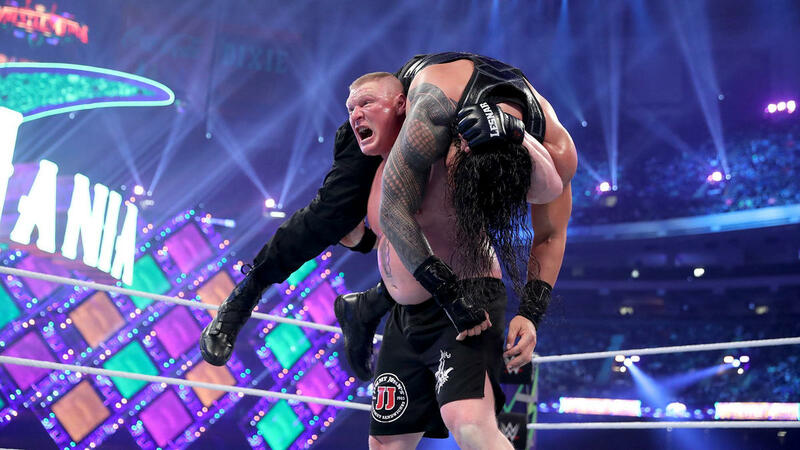 If Roman Reigns couldn't defeat Brock Lesnar after three years of preparation, then what would ever make us believe that he could beat him again, short of a full-on double turn? Everyone, even Reigns haters, was ready for a victory. Lesnar retaining means we'll just get more of the same. They wasted a good character arc in Reigns having the gumption to keep kicking out of F-5s through sheer willpower, which made sense here because he's been through so much with Brock.